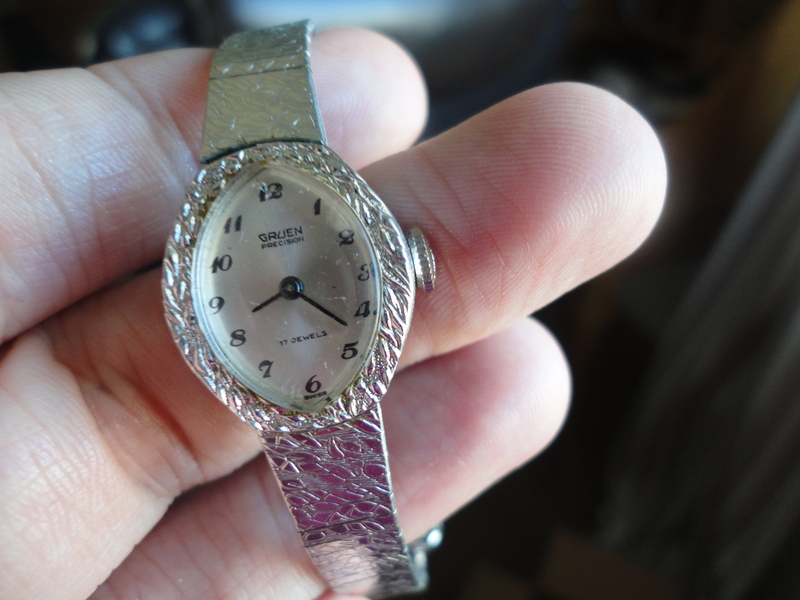 In the early 1960’s, my father gave his mother a watch for her birthday. It wouldn’t have cost much. They were a farming family with twelve kids, so there wasn’t a lot to go around. But my father, who would have been under 10 at the time, had wanted to give her something special, and he bought this watch. My grandmother died when I was about 6. I don’t remember much of her. I know she had a hard life. From what I understand, she had a step-mother who hated her when she was a child, and she suffered from mental illness much of her life. The treatment back then was shock therapy. She raised twelve children and was widowed quite early. Her children loved her, but keeping up a relationship with her was difficult. Her illness wasn’t her fault, but the effects of it still linger. Time has a way of softening all those edges, though. The memories are not mine, and a granddaughter she hardly knew from a marriage she disapproved of now owns her watch. I take it out from time to time and look at it, wondering about the life my grandmother led. Not all stories are happy ones. Not all stories are easy. I don’t have a daughter of my own, so one day I hope to pass it down to my own granddaughter, and she will have a watch that was worn by her great-great-grandmother. In my mind, she’s in Heaven now. The illness that plagued her for a lifetime is now gone. Her mind is clear. The pain and anger were wiped away, and perhaps–at least I like to think–she’d be happy to know that I have the watch her little boy gave her one birthday.